This article is about Japanese cuisine. For the ancient Chinese poet, see Su Shi. For other uses, see Sushi (disambiguation). Sushi originates in a Southeast Asian dish, known today as narezushi (馴れ寿司, 熟寿司 – "salted fish"), stored in fermented rice for possibly months at a time. The lacto-fermentation of the rice prevented the fish from spoiling; the rice would be discarded before consumption of the fish. This early type of sushi became an important source of protein for its Japanese consumers. The term sushi comes from an antiquated grammatical form no longer used in other contexts, and literally means "sour-tasting"; the overall dish has a sour and umami or savoury taste. Narezushi still exists as a regional specialty, notably as funa-zushi from Shiga Prefecture. Osaka-style sushi, also called "Oshi-zushi" or "hako-sushi"
Vinegar began to be added to the preparation of narezushi in the Muromachi period (1336–1573) for the sake of enhancing both taste and preservation. In addition to increasing the sourness of the rice, the vinegar significantly increased the dish's longevity, causing the fermentation process to be shortened and eventually abandoned. The primitive sushi would be further developed in Osaka, where over several centuries it became oshi-zushi or "hako-zushi"; in this preparation, the seafood and rice were pressed into shape with wooden (typically bamboo) molds. It was not until the Edo period (1603-1868) that fresh fish was served over vinegared rice and nori. The particular style of today's nigirizushi became popular in Edo (contemporary Tokyo) in the 1820s or 1830s. One common story of nigirizushi's origins is of the chef Hanaya Yohei (1799-1858), who invented or perfected the technique in 1824 at his shop in Ryōgoku. The dish was originally termed Edomae zushi as it used freshly caught fish from the Edo-mae (Edo or Tokyo Bay); the term Edomae nigirizushi is still used today as a by-word for quality sushi, regardless of its ingredients' origins. The earliest written mention of sushi in English described in the Oxford English Dictionary is in an 1893 book, A Japanese Interior, where it mentions sushi as "a roll of cold rice with fish, sea-weed, or some other flavoring". There is an earlier mention of sushi in James Hepburn's Japanese-English dictionary from 1873, and an 1879 article on Japanese cookery in the journal Notes and Queries. 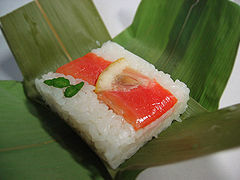 The common ingredient in all types of sushi is vinegared sushi rice. Fillings, toppings, condiments, and preparation vary widely. 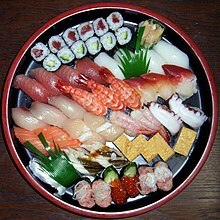 Due to rendaku consonant mutation, sushi is spelled with zu instead of su when a prefix is attached, as in nigirizushi. Chirashizushi (ちらし寿司, "scattered sushi", also referred to as barazushi) serves the rice in a bowl and tops it with a variety of raw fish and vegetable garnishes. It is commonly eaten because it is filling, fast and easy to make. It is eaten annually on Hinamatsuri in March. Edomae chirashizushi (Edo-style scattered sushi) is served with uncooked ingredients in an artful arrangement. Gomokuzushi (Kansai-style sushi) consists of cooked or uncooked ingredients mixed in the body of rice. Sake-zushi (Kyushu-style sushi) uses rice wine over vinegar in preparing the rice, and is topped with shrimp, sea bream, octopus, shiitake mushrooms, bamboo shoots and shredded omelette. Inarizushi (稲荷寿司) is a pouch of fried tofu typically filled with sushi rice alone. Tales tell that inarizushi is named after the Shinto god Inari. Foxes, messengers of Inari, are believed to have a fondness for fried tofu, and an Inari-zushi roll has pointed corners that resemble fox ears. Regional variations include pouches made of a thin omelette (帛紗寿司, fukusa-zushi, or 茶巾寿司, chakin-zushi) instead of tofu. It should not be confused with inari maki, which is a roll filled with flavored fried tofu. 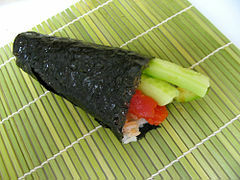 Cone sushi is a variant of inarizushi originating in Hawaii that may include green beans, carrots, or gobo along with rice, wrapped in a triangular aburage piece. It is often sold in okazu-ya (Japanese delis) and as a component of bento boxes. Square-style makizushi made without nori. The bottom pieces have been seasoned with wasabi. 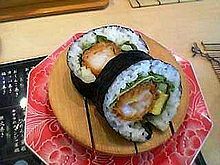 Futomaki (太巻, "thick, large or fat rolls") is a large cylindrical piece, usually with nori on the outside. A typical futomaki is five to six centimetres (2 to 2 1⁄2 in) in diameter. They are often made with two, three, or more fillings that are chosen for their complementary tastes and colors. During the evening of the Setsubun festival, it is traditional in the Kansai region to eat uncut futomaki in its cylindrical form, where it is called ehō-maki (恵方巻, lit. happy direction rolls). By 2000 the custom had spread to all of Japan. Futomaki are often vegetarian, and may utilize strips of cucumber, kampyō gourd, takenoko bamboo shoots, or lotus root. Strips of tamagoyaki omelette, tiny fish roe, chopped tuna, and oboro (food) whitefish flakes are typical non-vegetarian fillings. Traditionally, the rice is lightly seasoned with salt and sesame oil/perilla oil. Popular protein ingredients are fish cakes, imitation crab meat, eggs, or seasoned beef rib-eye. Vegetables usually include cucumbers, spinach, carrot and takuan (沢庵) (pickled radish). After the makizushi has been rolled and sliced, it is typically served with takuan. Short grain white rice is usually used, although short-grain brown rice, like olive oil on nori, is now becoming more widespread among the health-conscious. Rarely, sweet rice is mixed in makizushi rice. Nowadays, the rice in makizushi can be many kinds of black rice, boiled rice and cereals etc.Besides the common ingredients listed above, some varieties may include cheese, spicy cooked squid, yakiniku, kamaboko, lunch meat, sausage, bacon or spicy tuna. The nori may be brushed with sesame oil or sprinkled with sesame seeds. In a variation, sliced pieces of makizushi may be lightly fried with egg coating. Tamago makizushi (玉子巻き寿司) is makizushi is rolled out by a thin egg. Tempura Makizushi (天ぷら 巻き寿司) or Agezushi (揚げ寿司ロール) is a fried version of the dish. Hosomaki (細巻, "thin rolls") is a small cylindrical piece, with nori on the outside. A typical hosomaki has a diameter of about 2.5 centimetres (1 in). They generally contain only one filling, often tuna, cucumber, kanpyō, thinly sliced carrots, or, more recently, avocado. Kappamaki, (河童巻) a kind of Hosomaki filled with cucumber, is named after the Japanese legendary water imp fond of cucumbers called the kappa. 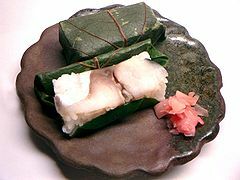 Traditionally, kappamaki is consumed to clear the palate between eating raw fish and other kinds of food, so that the flavors of the fish are distinct from the tastes of other foods. Tekkamaki (鉄火巻) is a kind of hosomaki filled with raw tuna. Although it is believed that the word tekka, meaning "red hot iron", alludes to the color of the tuna flesh or salmon flesh, it actually originated as a quick snack to eat in gambling dens called tekkaba (鉄火場), much like the sandwich. Negitoromaki (ねぎとろ巻) is a kind of hosomaki filled with scallion (negi) and chopped tuna (toro). Fatty tuna is often used in this style. 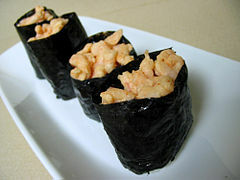 Tsunamayomaki (ツナマヨ巻) is a kind of hosomaki filled with canned tuna tossed with mayonnaise. 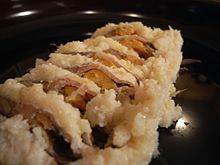 Ehōmaki (恵方巻, "lucky direction roll") is a roll composed of seven ingredients considered to be lucky. Ehōmaki are often eaten on setsubun in Japan. The typical ingredients include kanpyō, egg, eel, and shiitake mushrooms. Ehōmaki often include other ingredients too. People usually eat the ehōmaki while facing the direction considered to be auspicious that year. Temaki (手巻, "hand roll") is a large cone-shaped piece of nori on the outside and the ingredients spilling out the wide end. A typical temaki is about 10 centimetres (4 in) long, and is eaten with fingers because it is too awkward to pick it up with chopsticks. For optimal taste and texture, temaki must be eaten quickly after being made because the nori cone soon absorbs moisture from the filling and loses its crispness, making it somewhat difficult to bite through. For this reason, the nori in pre-made or take-out temaki is sealed in plastic film which is removed immediately before eating. Narezushi (熟れ寿司, "matured sushi") is a traditional form of fermented sushi. Skinned and gutted fish are stuffed with salt, placed in a wooden barrel, doused with salt again, then weighed down with a heavy tsukemonoishi (pickling stone). As days pass, water seeps out and is removed. After six months, this sushi can be eaten, remaining edible for another six months or more. The most famous variety of narezushi are the ones offered as a specialty dish of Shiga Prefecture, particularly the funa-zushi made from fish of the crucian carp genus, the authentic version of which calls for the use nigorobuna, a particular locally differentiated variety of wild goldfish endemic to Lake Biwa). Not to be confused with Onigiri. Temarizushi (手まり寿司, "ball sushi") is a sushi made by pressing rice and fish into a ball-shaped form by hand using a plastic wrap. Oshizushi (押し寿司, "pressed sushi"), also known as hako-zushi (箱寿司, "box sushi"), is a pressed sushi from the Kansai region, a favorite and specialty of Osaka. A block-shaped piece is formed using a wooden mold, called an oshibako. The chef lines the bottom of the oshibako with the toppings, covers them with sushi rice, and then presses the lid of the mold down to create a compact, rectilinear block. The block is removed from the mold and then cut into bite-sized pieces. 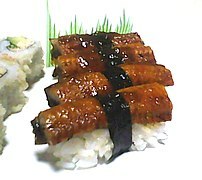 Particularly famous is バッテラ (battera, pressed mackerel sushi) or 鯖寿司 (saba zushi). In oshizushi, all the ingredients are either cooked or cured and raw fish is never used. Norway roll (ノルウェー巻き). A Norwegian businessman introduced the use of salmon as a sushi ingredient to Japan in the 1980s. The increasing popularity of sushi around the world has resulted in variations typically found in the Western world, but rarely in Japan. A notable exception to this is the use of salmon, which was introduced by a Norwegian businessman tasked with helping the Norwegian salmon industry in the 1980s.. 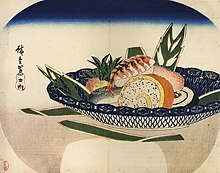 Such creations to suit the Western palate were initially fueled by the invention of the California roll (a norimaki with crab (later, imitation crab), cucumber, and avocado). A wide variety of popular rolls (norimaki and uramaki) has evolved since. Norway roll is another variant of uramakizushi filled with tamago (omelette), imitation crab and cucumber, rolled with shiso leaf and nori, topped with slices of Norwegian salmon, garnished with lemon and mayonnaise. Uramaki (裏巻, "inside-out roll") is a medium-sized cylindrical piece with two or more fillings, and was developed as a result of the creation of the California roll, as a method originally meant to hide the nori. Uramaki differs from other makimono because the rice is on the outside and the nori inside. The filling is in the center surrounded by nori, then a layer of rice, and optionally an outer coating of some other ingredients such as roe or toasted sesame seeds. It can be made with different fillings, such as tuna, crab meat, avocado, mayonnaise, cucumber or carrots. Futomaki is a more popular variation of sushi within the United States, and comes in variations that take their names from their places of origin. Other rolls may include a variety of ingredients, including chopped scallops, spicy tuna, beef or chicken teriyaki roll, okra, and assorted vegetables such as cucumber and avocado, and the tempura roll, where shrimp tempura is inside the roll or the entire roll is battered and fried tempura-style. In the Southern United States, many sushi restaurants prepare rolls using crawfish. 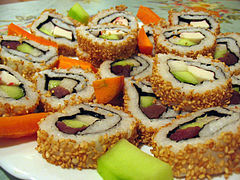 Sometimes, rolls are made with brown rice or black rice, which appear in Japanese cuisine as well. 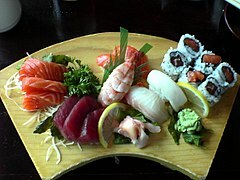 Per Food and Drug Administration regulations, raw fish served in the United States must be frozen prior to serving in order to kill parasites. Because of this and the relative difficulty of acquiring fresh seafood compared to Japan, raw seafood (e.g., sashimi) is not as prevalent a component in American-style sushi. Alaskan roll a variant of the California roll with raw salmon on the inside, or layered on the outside. Boston roll An uramaki California roll with poached shrimp instead of imitation crab. Dynamite roll includes yellowtail (hamachi) or prawn tempura, and fillings such as bean sprouts, carrots, avocado, cucumber, chili, spicy mayonnaise, and roe. New Mexico roll originating in New Mexico; includes New Mexico green chile (sometimes tempura fried), teriyaki sauce, and rice. Sometimes simply referred to as a "green chile (tempura) roll" within the state. Philadelphia roll consists of raw or smoked salmon, cream cheese (the name refers to Philadelphia cream cheese), cucumber or avocado, or onion. Rainbow roll is a California roll uramaki with multiple types of fish (commonly yellowtail, tuna, salmon, snapper, white fish, eel, etc.) and avocado wrapped around it. Spicy tuna roll includes raw tuna mixed with hot sauce infused mayonnaise. Sushi burrito a large, customizable roll offered in a number of "sushi burrito" restaurants in the United States. All sushi has a base of specially prepared rice, complemented with other ingredients. Sushi-meshi 鮨飯 (also known as Su-meshi 酢飯, shari 舎利, or gohan ご飯) is a preparation of white, short-grained, Japanese rice mixed with a dressing consisting of rice vinegar, sugar, salt, and occasionally kombu and sake. It has to be cooled to room temperature before being used for a filling in a sushi or else it will get too sticky while being seasoned. Traditionally, the mixing is done with a hangiri, which is a round, flat-bottom wooden tub or barrel, and a wooden paddle (shamoji). Sushi rice is prepared with short-grain Japanese rice, which has a consistency that differs from long-grain strains such as those from India, Sri Lanka, Bangladesh, Thailand, and Vietnam. The essential quality is its stickiness or glutinousness, although the type of rice used for sushi is different from glutinous rice. Freshly harvested rice (shinmai) typically contains too much water, and requires extra time to drain the rice cooker after washing. In some fusion cuisine restaurants, short-grain brown rice and wild rice are also used. There are regional variations in sushi rice and individual chefs have their individual methods. Most of the variations are in the rice vinegar dressing: the Kantō region (or East Japan) version of the dressing commonly uses more salt; in Kansai region (or West Japan), the dressing has more sugar. 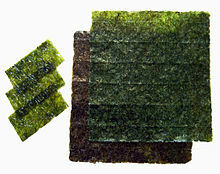 The black seaweed wrappers used in makimono are called nori (海苔). Nori is a type of algae, traditionally cultivated in the harbors of Japan. Originally, algae was scraped from dock pilings, rolled out into thin, edible sheets, and dried in the sun, in a process similar to making rice paper. Today, the commercial product is farmed, processed, toasted, packaged, and sold in sheets. Sushi made of meats other than fish (whether raw or cooked) is a variation often seen in Japan. For culinary, sanitary, and aesthetic reasons, the minimum quality and freshness of fish to be eaten raw must be superior to that of fish which is to be cooked. Sushi chefs are trained to recognize important attributes, including smell, color, firmness, and freedom from parasites that may go undetected in commercial inspection. Commonly used fish are tuna (maguro, shiro-maguro), Japanese amberjack, yellowtail (hamachi), snapper (kurodai), mackerel (saba), and salmon (sake). The most valued sushi ingredient is toro, the fatty cut of the fish. 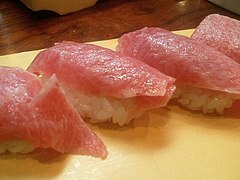 This comes in a variety of ōtoro (often from the bluefin species of tuna) and chūtoro, meaning "middle toro", implying that it is halfway into the fattiness between toro and the regular cut. Aburi style refers to nigiri sushi where the fish is partially grilled (topside) and partially raw. Most nigiri sushi will have completely raw neta. Other seafoods such as squid (ika), eel (anago and unagi), pike conger (hamo), octopus (tako), shrimp (ebi and amaebi), clam (mirugai, aoyagi and akagai), fish roe (ikura, masago, kazunoko and tobiko), sea urchin (uni), crab (kani), and various kinds of shellfish (abalone, prawn, scallop) are the most popular seafoods in sushi. Oysters, however, are less common, as the taste is not thought to go well with the rice. Kani kama, or imitation crab stick, is commonly substituted for real crab, most notably in California rolls. Pickled daikon radish (takuan) in shinko maki, pickled vegetables (tsukemono), fermented soybeans (nattō) in nattō maki, avocado, cucumber in kappa maki, asparagus, yam, pickled ume (umeboshi), gourd (kanpyō), burdock (gobo), and sweet corn (possibly mixed with mayonnaise) are also used in sushi. Tofu and eggs (in the form of slightly sweet, layered omelette called tamagoyaki and raw quail eggs ride as a gunkan-maki topping) are common. Sushi is commonly eaten with condiments. Sushi may be dipped in shōyu (soy sauce), and is usually flavored with wasabi, a piquant paste made from the grated stem of the Wasabia japonica plant. Japanese-style mayonnaise is a common condiment in Japan on salmon, pork and other sushi cuts. True wasabi has anti-microbial properties and may reduce the risk of food poisoning. The traditional grating tool for wasabi is a sharkskin grater or samegawa oroshi. An imitation wasabi (seiyo-wasabi), made from horseradish, mustard powder and green dye is common. It is found at lower-end kaiten-zushi restaurants, in bento box sushi and at most restaurants outside Japan. If manufactured in Japan, it may be labelled "Japanese Horseradish". Gari (sweet, pickled ginger) is eaten in between sushi courses to both cleanse the palate and aid in digestion. In Japan, green tea (ocha) is invariably served together with sushi. Better sushi restaurants often use a distinctive premium tea known as mecha. In sushi vocabulary, green tea is known as agari. Sushi may be garnished with gobo, grated daikon, thinly sliced vegetables, carrots/radishes/cucumbers that have been shaped to look like flowers, real flowers, or seaweed salad. When closely arranged on a tray, different pieces are often separated by green strips called baran or kiri-zasa (切り笹). These dividers prevent the flavors of neighboring pieces of sushi from mixing and help to achieve an attractive presentation. Originally, these were cut leaves from the Aspidistra elatior (葉蘭 haran) and Sasa veitchii (熊笹 kuma-zasa) plants, respectively. Using actual leaves had the added benefit of releasing antimicrobial phytoncides when cut thereby extending the limited shelf life of the sushi. Sushi bento boxes are a staple of Japanese supermarkets and convenience stores. As these stores began rising in prominence in the 1960s, the labor-intensive cut leaves were increasingly replaced with green plastic in order to lower costs. This coincided with the increased prevalence of refrigeration which acted to extend the shelf life of sushi without the need for the cut leaves. 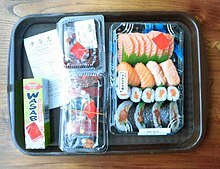 Today the plastic strips are commonly used in sushi bento boxes and to a lesser degree in sushi presentations found in sushi bars and restaurants. In store-sold or to-go packages of sushi, the plastic leaf strips are often used to prevent the rolls from coming into early or unwanted contact with the ginger and wasabi included with the dish. Sushi in shops are usually sold in plastic trays. The main ingredients of traditional Japanese sushi, raw fish and rice, are naturally low in fat, high in protein, carbohydrates (the rice only), vitamins, and minerals, as are gari and nori. 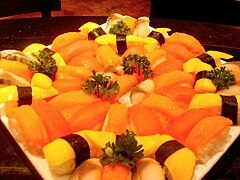 Other vegetables wrapped within the sushi also offer various vitamins and minerals. Many of the seafood ingredients also contain omega-3 fatty acids, which have a variety of health benefits. The omega-3 fatty acids found in fish has certain beneficial property, especially on cardiovascular health, natural anti-inflammatory compounds, and play a role in brain function. Generally sushi is not a particularly fattening food. However, rice in sushi contains a fair amount of carbohydrates, plus the addition of other ingredients such as mayonnaise added into sushi rolls might increase the caloric content. Sushi also has a relatively high sodium content, especially contributed from shoyu soy sauce seasoning. Some of the ingredients in sushi can present health risks. Large marine apex predators such as tuna (especially bluefin) can harbor high levels of methylmercury, which can lead to mercury poisoning when consumed in large quantity or when consumed by certain higher-risk groups, including women who are pregnant or may become pregnant, nursing mothers and young children. According to recent studies, there have been about 18 million infections worldwide from eating raw fish. This serves as a great risk to expecting mothers due to the health risks that medical interventions or treatment measures may pose on the developing fetus. Parasitic infections can have a wide range of health impacts, including bowel obstruction, anemia, liver disease, and more. The impact of these illnesses alone can pose some health concerns on the expecting mother and baby, but the curative measures that may need to take place to recover, are also a concern as well. For the above reasons, EU regulations forbid the use of fresh raw fish. It must be frozen at temperatures below −20 °C (−4 °F) in all parts of the product for no less than 24 hours. As such, a number of fishing boats, suppliers and end users "super-freeze" fish for sushi to temperatures as low as −60 °C. As well as parasite destruction, super-freezing also prevents oxidation of the blood in tuna flesh, thus preventing the discoloration that happens at temperatures above −20 °C. Some forms of sushi, notably those containing pufferfish fugu and some kinds of shellfish, can cause severe poisoning if not prepared properly. Particularly, fugu consumption can be fatal. Fugu fish has a lethal dose of tetrodotoxin in its internal organs and, by law in many countries, must be prepared by a licensed fugu chef who has passed the prefectural examination in Japan. The licensing examination process consists of a written test, a fish-identification test, and a practical test that involves preparing the fugu and separating out the poisonous organs. Only about 35 percent of the applicants pass. Sustainable sushi is sushi made from fished or farmed sources that can be maintained or whose future production does not significantly jeopardize the ecosystems from which it is acquired. Concerns over the sustainability of sushi ingredients arise from greater concerns over environmental, economic and social stability and human health. Sushi served on a wooden platter at a sushi restaurant in Kanagawa Prefecture (神奈川県), Japan. Many sushi restaurants offer fixed-price sets, selected by the chef from the catch of the day. These are often graded as shō-chiku-bai (松竹梅), shō/matsu (松, pine), chiku/take (竹, bamboo) and (bai/ume), with matsu the most expensive and ume the cheapest. Sushi restaurants will often have private booth dining, where guests are asked to remove their shoes, leaving them outside the room; However, most sushi bars offer diners a casual experience with an open dining room concept. Sushi may be served kaiten zushi (sushi train) style. Color-coded plates of sushi are placed on a conveyor belt; as the belt passes, customers choose as they please. After finishing, the bill is tallied by counting how many plates of each color have been taken. Newer kaiten zushi restaurants use barcodes or RFID tags embedded in the dishes to manage elapsed time after the item was prepared. Some specialized or slang terms are used in the sushi culture. Most of these terms are used only in sushi bars. Agari: "Rise up" Green tea. Ocha (お茶) in usual Japanese. Gari: Sweet, pickled and sliced ginger, or sushi ginger. Shōga (生姜) in standard Japanese. Gyoku: "Jewel". Sweet and cubic-shaped omelette. Tamagoyaki (卵焼, 玉子焼) in standard Japanese. Murasaki: "Violet" or "purple" (color). Soy sauce. Shōyu (醤油) in standard Japanese. Neta: Toppings on nigiri or fillings in makimono. Ne-ta is from reversal of ta-ne. Tane (種) in standard Japanese. Oaiso: "Compliment". Bill or check. Oaiso may be used in not only sushi bars but also izakaya. Okanjō or chekku (お勘定 or チェック) in standard Japanese. Otemoto: Chopsticks. Otemoto means the nearest thing from the customer seated. Hashi (箸) or ohashi in standard Japanese. Sabi: Japanese horseradish. Contracted form of wasabi (山葵). Shari: Vinegar rice or rice. It may originally be from Sanskrit (zaali शालि) meaning rice or Śarīra. Gohan (ご飯) or meshi (飯) in standard Japanese. Tsume: Sweet thick sauce mainly made of soy sauce. Nitsume (煮詰め) in standard Japanese. Unlike sashimi, which is almost always eaten with chopsticks, nigirizushi is traditionally eaten with the fingers, even in formal settings. Although it is commonly served on a small platter with a side dish for dipping, sushi can also be served in a bento, a box with small compartments that hold the various dishes of the meal. 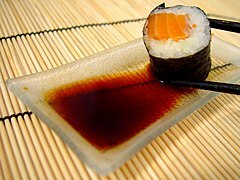 Soy sauce is the usual condiment, and sushi is normally served with a small sauce dish, or a compartment in the bento. Traditional etiquette suggests that the sushi is turned over so that only the topping is dipped; this is because the soy sauce is for flavoring the topping, not the rice, and because the rice would absorb too much soy sauce and would fall apart. If it is difficult to turn the sushi upside-down, one can baste the sushi in soy sauce using gari (sliced ginger) as a brush. 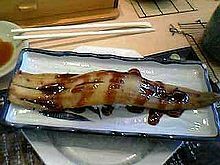 Toppings that have their own sauce (such as eel) should not be eaten with soy sauce. 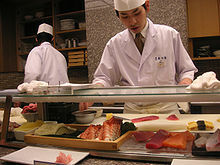 Traditionally, the sushi chef will add an appropriate amount of wasabi to the sushi while preparing it, and etiquette suggests eating the sushi as is, since the chef is supposed to know the proper amount of wasabi to use. However, today wasabi is more a matter of personal taste, and even restaurants in Japan may serve wasabi on the side for customers to use at their discretion, even when there is wasabi already in the dish. ^ "Food History Timeline, Events in Food History, 50,000 BC to 2012". Retrieved 30 December 2016. ^ Hill, Amelia (2007-10-08). "Chopsticks at dawn for a sushi showdown". London: The Guardian. Retrieved 25 September 2011. ^ Kouji Itou; Shinsuke Kobayashi; Tooru Ooizumi; Yoshiaki Akahane (2006). "Changes of proximate composition and extractive components in narezushi, a fermented mackerel product, during processing". Fisheries Science. 72 (6): 1269–1276. doi:10.1111/j.1444-2906.2006.01285.x. ^ a b Bestor, Theodore C. (2004-07-13). Tsukiji: The Fish Market at the Center of the World. p. 141. ISBN 9780520923584. ^ Lowry, Dave (2010). The Connoisseur's Guide to Sushi. ReadHowYouWant.com. p. xvii. ISBN 978-1458764140. A nugget of rice was seasoned with vinegar and topped by a sliver of seafood fresh from the bay that was only a few blocks away. That's why a synonym for nigiri sushi is Edomae sushi: Edomae is "in front of Edo", i.e., the bay. ^ Mouritsen, Ole G. (2009). Sushi: Food for the Eye, the Body and the Soul. Springer. p. 17. ISBN 978-1441906182. Edomae-zushi or nigiri-zushi? 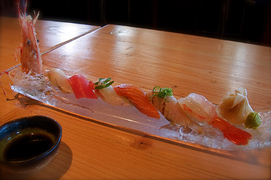 Nigiri-zushi is also known as Edomae-zushi. Edomae refers to the small bay in Edo in front of the old palace that stood on the same site as the present-day imperial precinct in Tokyo. Fresh fish and shellfish caught in the bay were used locally to make sushi, which was known as Edomae-zushi. It has, however, been many years since these waters have been a source of seafood. Now the expression Edomae-zushi is employed as a synonym for high quality nigiri-zushi. ^ "Sushi", Oxford English Dictionary, Second edition, 1989; online version December 2011. Accessed 23 December 2011. ^ Bacon, Alice Mabel (1893). A Japanese interior. Houghton, Mifflin and Company. p. 271.
p. 271: "Sushi, a roll of cold rice with fish, sea-weed, or some other flavoring"
p. 181: "While we were waiting for my lord and my lady to appear, domestics served us with tea and sushi or rice sandwiches, and the year-old baby was brought in and exhibited." p. 180: "All the sushi that I had been unable to eat were sent out to my kuruma, neatly done up in white paper." ^ Kawasumi, Ken (2001). The Encyclopedia of Sushi Rolls. Graph-Sha. ISBN 978-4-88996-076-1. ^ Smyers, Karen Ann. The Fox and the Jewel: Shared and Private Meanings in Contemporary Japanese Inari Worship(1999), Honolulu: University of Hawaii Press, p. 96. ^ Ann Kondo Corum, Ethnic Foods of Hawaii (2000). Bess Press: p. 54. ^ Betty Shimabukuro, "Yama's Fish Market offers more than fish (March 20, 2002). Honolulu Star-Bulletin. ^ Joan Namkoong, Go Home, Cook Rice: A Guide to Buying and Cooking the Fresh Foods of Hawaii (2001). Ness Press: p. 8. ^ Joan Namkoong, Food Lover's Guide to Honolulu (2006), Bess Press, p. 37. ^ a b Ōmae, Kinjirō; Tachibana, Yuzuru (1988). The book of sushi (1st paperback ed.). Tokyo: Kōdansha International. p. 70. ISBN 9780870118661. OCLC 18925025. ^ a b Strada, Judi; Moreno, Mineko Takane (2004). Sushi for dummies. John Wiley & Sons. p. 106. ISBN 978-0-7645-4465-1. Sliced sushi rolls are traditionally made in three different sizes, or diameters: thin 1-inch rolls (hoso-maki); medium ​1 1⁄2-inch rolls (chu-maki); and thick 2 to ​2 1⁄2-inch rolls (futo-maki)." ^ "Setsubun [節分]". Heisei Nippon seikatsu benrichō [平成ニッポン生活便利帳] (in Japanese). Tokyo: Jiyū Kokuminsha. 2012. Archived from the original on August 25, 2007. Retrieved 2012-05-26. 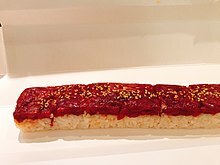 ^ "Ehō-maki". Dijitaru daijisen (in Japanese). Tokyo: Shogakukan. 2012. Archived from the original on August 25, 2007. Retrieved 2012-05-26. ^ Andy Bellin (March 2005). "Poker Night in Napa". Food & Wine. ^ Ryuichi Yoshii, "Tuna rolls (Tekkamaki)", Sushi, p. 48 (1999), Tuttle Publishing, ISBN 962-593-460-X. 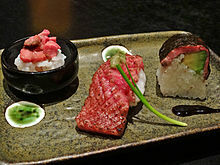 ^ "Setsubun Ehomaki, Mame-maki and Grilled Sardine". Kyoto Foodie. Retrieved 2015-01-22. ^ "Packaging For Temaki Sushi". Gpe.dk. Retrieved 2012-11-07. ^ Hosking, Richard (1997). A Dictionary of Japanese Food: Ingredients & Culture. Tuttle Publishing. p. 222. ISBN 978-0-8048-2042-4. ^ Steinkraus, Keith H. (1993). Comparison of Fermented Foods of the East and West. Fish Fermentation Technology. United Nations University Press. p. 132. ISBN 9788970530031. : "still being produced prototypical form.. around Lake Biwa". ^ Chad Hershler (May 2005). "Sushi Then and Now". The Walrus. Archived from the original on 2010-01-14. ^ (ja) 軍カン巻の由来, お寿し大辞典 > お寿し用語集, 小僧寿しチェーン. ^ Ashkenazi, Michael; Jacob, Jeanne (2000). The essence of Japanese cuisine: an essay on food and culture. University of Pennsylvania Press. p. 231. ISBN 978-0-8122-3566-1. Called saba zushi or battera, after the Portuguese term for "small boat", which the mould resembles. ^ "Osaka Style Boxed Sushi". Sushi Encyclopedia. Archived from the original on January 16, 2008. ^ a b Jiang, Jess (18 September 2015). "How the Desperate Norwegian Salmon Industry Created a Sushi Staple". Planet Money (blog/podcast). All Things Considered. NPR. Retrieved 19 September 2015. ^ Sollesnes, Oeystein (March 10, 2018). "The Norwegian campaign behind Japan's love of salmon sushi". The Japan Times. Retrieved January 9, 2019. ^ Norway Exports (8 April 2011). "Norway's Introduction of Salmon Sushi to Japan". Nortrade. Retrieved 19 September 2015. ^ "Norway Roll of Umegaoka Sushi No Midori Sohonten Shibuya". ^ "Sushi Pioneers". SushiMasters. Archived from the original on 2013-04-11. Retrieved 2008-07-26. ^ Julia Moskin (April 8, 2004). "Sushi Fresh From the Deep . . . the Deep Freeze". New York Times. Retrieved 2013-12-23. Most would be even more surprised to learn that if the sushi has not been frozen, it is illegal to serve it in the United States. Food and Drug Administration regulations stipulate that fish to be eaten raw -- whether as sushi, sashimi, seviche, or tartare -- must be frozen first, to kill parasites. ^ "Alaska Roll". Sushi Sama. Archived from the original on 18 December 2013. Retrieved 11 December 2013. ^ "Boston Roll Recipe". Sushi Encyclopedia. Archived from the original on 9 October 2014. Retrieved 15 October 2014. ^ "What is a BC Roll?". The Sushi Index. Retrieved 11 December 2013. ^ "California Roll". Sushi Sama. Archived from the original on 18 December 2013. Retrieved 11 December 2013. ^ "Dynamite Roll Recipe". Japanese Sushi Recipes. Retrieved 11 December 2013. ^ Frisch, Eleanor. "Japanese and Western Types of Sushi". Food Service Warehouse. Retrieved 11 December 2013. ^ De Laurentiis, Giada. "Crab, Avocado and Mango Roll". Food Network. Retrieved 11 December 2013. 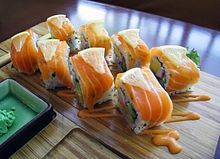 ^ "Michigan Roll Recipe". The Sushi Encyclopedia. Retrieved 11 December 2013. ^ Romero, David (2015-07-13). "Green chile prominently featured in sushi roll". KRQE. Retrieved 16 May 2016. ^ Garduño, Gil (2011-10-29). "I Love Sushi – Albuquerque, New Mexico". Gil's Thrilling (And Filling) Blog. Retrieved 16 May 2016. ^ "Sushi order form". Japanese Kitchen Albuquerque. Retrieved 16 May 2016. ^ "Sushi order form". Nagomi Restaurant ABQ. Retrieved 16 May 2016. ^ "Philadelphia Roll Recipe". Sushi Encyclopedia. Retrieved 11 December 2013. ^ "Rainbow Roll Recipe". Sushi Encyclopedia. Archived from the original on 27 June 2013. Retrieved 11 December 2013. ^ "Spicy Seattle Tuna Rolls". Bon Appetit. Retrieved 11 December 2013. ^ Moonen, Rick. "Spider Roll". Food Network. Retrieved 11 December 2013. ^ Kearns, Landess (2015-06-19). "Sushi Burritos Prove You Really Can Have It All". Huffington Post. The Huffington Post. Retrieved 14 May 2017. ^ Shin, I. S.; Masuda H.; Naohide K. (August 2004). "Bactericidal activity of wasabi (Wasabia japonica) against Helicobacter pylori". International Journal of Food Microbiology. 94 (3): 255–61. doi:10.1016/S0168-1605(03)00297-6. PMID 15246236. ^ Shimbo, Hiroko (2000). The Japanese Kitchen. Harvard Common Press. ISBN 978-1-55832-176-2. ^ Gordenker, Alice (2008-01-15). "Bento grass". The Japan Times Online. ISSN 0447-5763. Retrieved 2015-12-08. ^ "Culinary Curiosities: That plastic leaf in sushi". CNN. June 21, 2010. ^ Lee, Bruce Y. "Eating Fish, Sleep, And Smarts: Here's What The Study Really Said". Forbes. Retrieved 2018-01-18. ^ a b MSc, Sylvie Tremblay,. "Is Eating Sushi Healthy? Plus the Best & Worst Sushi to Order". LIVESTRONG.COM. Retrieved 2018-01-18. ^ "Sushi Calories and Nutritional Information". The Sushi FAQ. Retrieved 2018-01-18. ^ Burros, Marian (2008-01-23). "High Mercury Levels Are Found in Tuna Sushi". The New York Times. ^ "Methylmercury: What You Need to Know About Mercury in Fish and Shellfish". Food and Drug Administration. 2004-03-01. Retrieved 2012-09-18. ^ a b c d Jones, J.L. ; Anderson, B.; Schulkin, J.; Parise, M. E.; Eberhard, M. L. (2011-03-01). "Sushi in Pregnancy, Parasitic Diseases – Obstetrician Survey". Zoonoses and Public Health. 58 (2): 119–125. doi:10.1111/j.1863-2378.2009.01310.x. ISSN 1863-2378. PMID 20042060. ^ "Clonorchis sinensis – Material Safety Data Sheets (MSDS)". Public Health Agency of Canada. 2011-02-18. Retrieved 2012-09-18. ^ "Parasites – Anisakiasis". Centers for Disease Control and Prevention. 2010-11-02. Retrieved 2012-09-18. ^ Dugdale, DC (2011-08-24). "Fish tapeworm". MedlinePlus. Retrieved 2012-09-18. ^ European Parliament (2004-04-30). "Regulation (EC) No 853/2004 of The European Parliament and of the Council of 29 April 2004 laying down specific hygiene rules for on the hygiene of foodstuffs" (pdf). Official Journal of the European Union. 139 (55): 133. ^ Issenberg, Sasha (2008). The sushi economy: globalization and the making of a modern delicacy. New York: Gotham. ISBN 978-1592403639. ^ Warin, Rosemary H.; Steventon, Glyn B.; Mitchell, Steve C. (2007). Molecules of death. Imperial College Press. p. 390. ISBN 978-1-86094-814-5. ^ "One Man's Fugu Is Another's Poison". The New York Times. 1981-11-29. Retrieved 2011-02-26. ^ "System and method for identification and tracking of food items" (PDF). U.S.Patent Office. ^ (in Japanese) Osushiyasan no arukikata お寿司屋さんの歩き方, Retrieved February 2012. ^ (in Japanese) 'Ojisan, oaiso' tsuihō undō 「おじさん、おあいそ」追放運動, Retrieved February 2012. ^ Honey, Kim (March 18, 2009). "Are you sushi savvy?". Toronto Star. Retrieved 2009-11-09. ^ Lowry, Dave (2005). The Connoisseur's Guide to Sushi. Harvard Common Press. p. 273. ISBN 978-1-55832-307-0. Wikimedia Commons has media related to Sushi.